BANGKOK (AP) — Mix one part superstition, two parts fashion, a dab of celebrity idolatry and a heap of media frenzy, and what do you get? 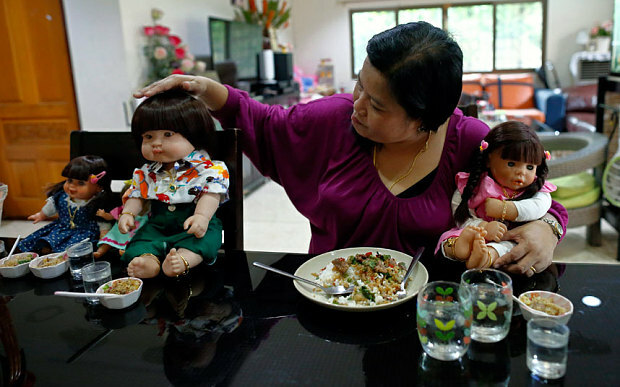 The "child angel" dolls, the latest craze in Thailand. [...] They will, their adult owners affirm, bring you good luck, especially if you treat them like your own living progeny, taking them along on trips, treating them to meals and praying together at the temple. While "luk thep" dolls, as they are known in Thai, have previously drawn only mild notice beyond the circle of their devoted collectors, they dominated the news this past week after a leaked memo from budget airline Thai Smile instructed staff to treat the dolls as if they were human passengers — provided, of course, their seats were paid for. The airline took note of the creepiness factor, suggesting the dolls best be seated as much as possible out of the sight of other passengers. I'm sorry, but are there no madhouses in Thailand? Does not one of these Chingy Chongs have any ethical qualms about taking money from an obviously deranged person? Imagine yourself in that position. Imagine, for example, you are a restaurateur, and someone comes to your establishment and orders 10 plates of food for their imaginary family. Then they sit there smearing the food over doll mouths and making num-num-num sounds. Is your response that as long as the credit card clears, everything is just fine? I'm just trying to gauge the depths to which humanity / sub-humanity has sunk. fried cat,shemales and pretend babies,whats not to love? Sounds like the perfect vacation spot for the QS and his basement-dwelling fanboys. Eventually, they will figure it out, and the Trump caps will go in the trash bin. However, it remains to be seen if White Whateverists will learn anything from this error. Every once in a while I see here a reference to QS. What/who is that? QS = Quadroon Streicher. The great and powerful Troll King. He who turns Rams into Pepes. He who brought the dank memes to the lost tribe of the Alt-Fags, and showed them the way to Glorious Leader. This dysgenic trend is to be commended among the chili-flingers. Chili-flingers? Ha! That's a new one.